British BDP has been appointed the winner of the masterplan competition for the New Hospital and New Psychiatry Bispebjerg in the northern part of Copenhagen, Denmark. The winning project divides the site into four quarters with a green park in the centre and allows space for the beautiful, heritage-listed pavilions and green gardens. After much anticipation, the winner of the masterplan for the New Hospital and New Psychiatry Bispebjerg has been found: British BDP takes home the prize together with Danish architects TKT and Rambøll Danmark. “The winning proposal has been selected because it plans the hospital as a city with four differ-ent quarters, each with its own distinctive character. Because the green and recreational areas are an important part of the plan. And because a simple and consistent traffic solution ensures calm, accessibility and orientation within the site,” states Regional Councillor Lars Gaardhøj (S), who is chairman of the project’s political reference group. The winning project divides the area into four quarters with individual, defined identities: The general hospital quarter in the northern part towards Tuborgvej, the psychiatric quarter in the north-eastern part, the historic quarter with administration, research and laboratories in the southern, heritage-listed part and a green park quarter with a central entrance area in the middle. ”An important part of the task was to establish settings for the new hospital, which respect the heritage-listed pavilions by Martin Nyrop. This challenge has been solved by ensuring distance to the old buildings, thereby creating space for many green areas. This honors the natural sce-nic Bispebjerg, as we know it today,” Lars Gaardhøj explains. 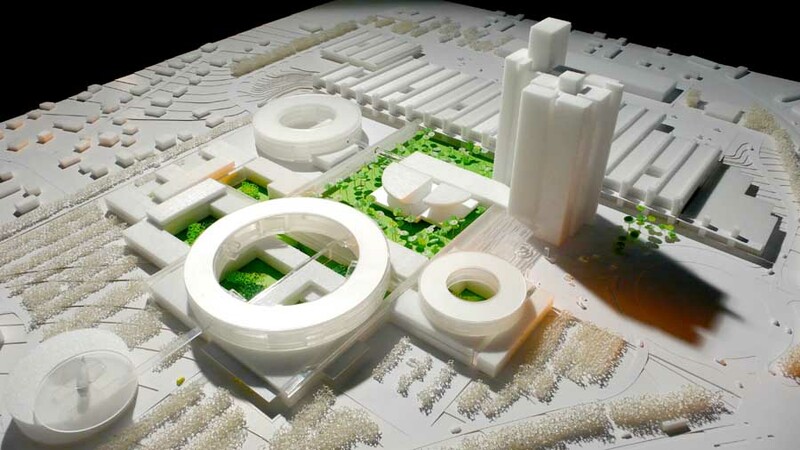 As a surprising feature, the winning project places the general hospital entrance area in the middle as a large, green pulsating heart. From here staff, patients and visitors gather and dis-tribute into the different quarters of the hospital. ”Much has been done to maintain and improve the green areas, providing both patients and staff easy access. The choices in the master plan ensure a green environment and a peaceful, urban feel to both the general hospital and the psychiatric facility,” states Claes Brylle Hallqvist, Vice Director of Bispebjerg and Frederiksberg Hospitals, who is in charge of the construction project. Today, the recreational areas are an integrated part of the daily lives of patients, staff and neighbours. The green vibe of the project and the calmness of the area have been secured for the future through a well-planned traffic solution with one-way roads and central parking facili-ties. As a result of this, the winning project solves the existing parking challenges of an unnec-essary traffic of drivers searching for a place to park. Another advantage of the winning project is that the psychiatric facility has successfully been situated in the north-eastern part of the site. This solution is an alternative to the suggested division of the facility in the eastern and southern parts of the site as it was proposed in the Competition Brief. This gives better coherence for patients and staff within the psychiatric facility and makes construction easier as the general hospital and psychiatric facility will not interfere with each other. ”The possibility of building and completing the new Joint Emergency Ward at an early stage of the construction period, allows us to provide new settings for the acute patients quickly. And the development can take place while the hospital is fully operational,” says Claes Brylle Hallqvist states. The winner of the masterplan competition is British BDP together with Danish architects TKT and Rambøll Danmark. It has been a close call. Two master plan proposals have gained distinction by – in strong master concepts – presenting visionary and solid settings for the development of the Bispebjerg Hospital site. Therefore, they continue in the competition of developing a Master Plan for the New Hospital and New Psychiatry Bispebjerg. British BDP and Danish Drees & Sommer Nordic are leaders of the two teams, which have won the first phase in the Master Plan competition for the New Hospital and New Psychiatry Bispebjerg. Six of the eight teams, who all have submitted their Master Plan proposals, have therefore been cut. The Master Plan shall, among others, describe how the different functions of the general hospital and the psychiatric facility should be placed in regards to their internal relations, how one enters the hospital site, how the traffic is managed, where to park ones car, how the logistics is managed and partially how the buildings should look. “The two proposals are the ones, who best reach into the future in a visionary way. They have the most flexible clinical structure by introducing respectively a landscape guiding concept and a structural urban net. We have prioritized the holistic and structuring system. They are both flexible and adaptable,” states the chairman of the jury, Lars Gaardhøj (S), Regional Councillor and chairman of the projects’ political reference group. The two selected proposals are very different from each other, and stand out from the other proposals by emphasizing the big qualities for the outdoor areas that can exist in keeping a distance to the historic buildings. “Both proposals present interesting, functional links between hospital and city by integrating outgoing functions and research. Furthermore, the park is made accessible and is strengthened as a resource for both the hospital and the neighbourhood,” states Janne Elsborg. The winner will be announced in June 2012. All eight Master Plan proposals will be displayed in the lobby of Building no. 60 at Bispebjerg Hospital, starting from Monday the 12th of March. After Easter, the exhibition will move to Frederiksberg Hospital.